A conflicted young man’s desire to become a priest is detoured by love and devotion to his family even as one member becomes entangled with the Mafia. Altar Boy is about the arcs of the life of Jack Van Duesen – his tests, trials, tribulations, joys, and sorrows. Set in the New York neighborhoods of Astoria and Brooklyn Heights, the story reveals how a young man overcomes personal conflicts only to be detoured from his desire to become a priest through doubt and love. Instead, he becomes a devoted husband and father, achieves success as a lawyer, and is saddened by his wife’s struggles with ALS before he confronts his most serious challenge when his granddaughter marries into the mob. In the end, faith, love, and devotion prevail. 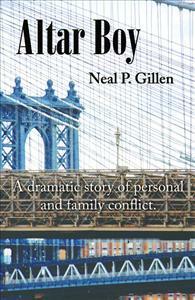 The "inside story" of Alter Boy opens up the Catholic Church, the New York legal system, and the subtle details of organized crime that touches both. Lively action and sharp talking characters moves the plot fast and direct to some surprising developments. A good read and lots of new views of the streets of New York.